To understand that those who call upon the name of the Lord will be saved. One of the children brought in some stick insects and showed them around and gave one to another child. I was as a backup going to buy some locusts from a pet shop to show what they looked at. Show a video on locusts. Discuss how a plague of locusts can destroy all of the vegetaion in an area. It is called a plague. Look at the prophesies of judgement for that time, for the time Jesus comes and for final judgement in Joel 2v25, Joel 2v28-32 and Acts 2v17-21. Key verse Joel 2v32: “And everyone who calls on the name of the Lord will be saved”. Discuss what it means to call on the Lord. 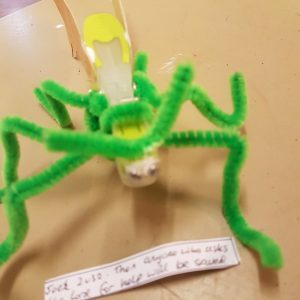 Use pipecleaners and a clothes peg and some googley eyes to make the locust. Get the childen to write out the verse Joel 2v32 onto the peg or a piece of paper to stick on.